Baby Bjorn Potty from Mothercare. All items are cleaned thoroughly and checked for hygiene and correct operation before renting. 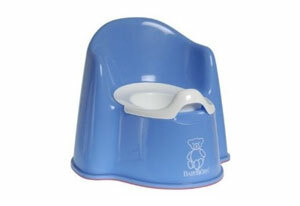 Ergonomically designed potty chair features rounded styling and lots of leg room so your child gets closer to the seat. High back support and armrests. Inner potty is easy to remove and clean. Rubber bottom edge keeps the Potty Chair in place.